Coppergate is a busy, modern and popular shopping complex in the centre of York, housing a multitude of big name high street shops, designer boutiques, specialist retailers and cafe's and museums. The centre is an open-air shopping promenade with covered walkways, and public squares with fountains and planting. Coppergate's outdoor area is used to host music performances, theatre productions and some of York's most popular annual events such as the St Nicholas Fayre Christmas market. It was here that a large group of craftsmen and traders of Viking Jorvik once lived and worked. The name derives from the the Old Norse Kopparigat which means the street of the joiners or turners. St Mary's Church at Coppergate (pictured right) is now used to display modern art exhibitions and belongs to York Art Gallery. 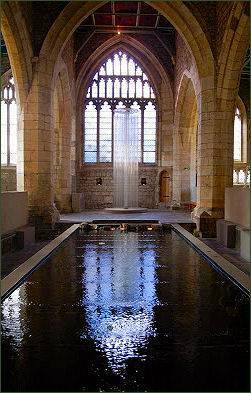 The church dates from the eleventh century, although most of the present building is thirteenth century. Admission is free. Numerous Viking remains were unearthed at Coppergate, prior to the construction of the shopping centre, the excavation of numerous Viking houses and finds of everyday objects are now displayed and brought to life in the Jorvik Viking Centre. The centre is one of Britain's most popular visitor attractions, which occupies the site of the 1970's archaeological dig and is housed in Coppergate. The centre has received over 17 million visitors over the past 30 years, who journey through the reconstruction of Viking Age streets, as they would have appeared 1,000 years ago. The Centre also offers four exhibitions and the chance to actually come face to face with a Viking. 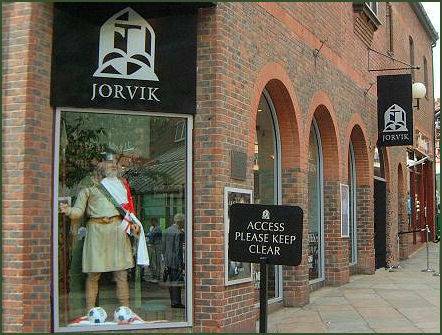 The Vikings settled in York, known to them as Jorvik, from 866-1066. In 1972 York Archaeological Trust, an educational charity, which was established in 1972, excavated small trenches beneath Lloyds Bank, uneathing the organic remains of timber buildings, textiles and leather. A major redevelopment had been proposed on the site of the old Craven's sweet factory at Coppergate, and York city council accepted that further excavations could be undertaken before work commenced. Between 1976 and 1981 archaeologists, students and local amateurs excavated over 1,000 square metres, finding the remains of tenth century Viking age buildings surrounded by moist, spongy layers of earth similar to that of a peat bog, the damp conditions had helped to preserve everyday Viking items and a mass of finds were unearthed from every era of York's history. The excavation shone a light on the city's Viking past. Finds included vast quantities of food remains such as animal bones and oyster shells, Roman and medieval roof tiles, weapons, a coin dye, timber and woven wattles, metal working slag and around a quarter of a million pieces of pottery. Archaeologists unearthed remarkable evidence of Viking cottage industry, including metalworking, jewellery making and the craft that gave Coppergate its name - the manufacture of wooden cups and bowls. The most fascinating find was the Coppergate Helmet (pictured left), also known as the York Helmet, a well preserved Anglo-Saxon helmet dating to the eighth century, which was found hidden in a well near what is now the Jorvik Viking Centre in 1982. Made of iron with brass ornamentation work it is one of only four such helmets of that era ever discovered. The helmet has two low crests of brass, one running from front to back the other from side to side, forming a cross shape when viewed from above. 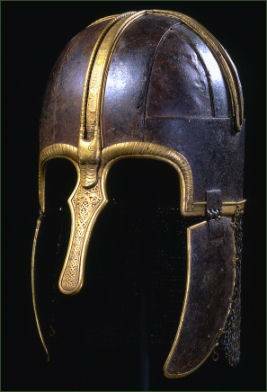 Its basic construction is almost identical to another surviving Anglo-Saxon helmet, the Pioneer helmet.The brass banding within the crests bears a Latin inscription:The helmet is now on display in the Yorkshire Museum in York.